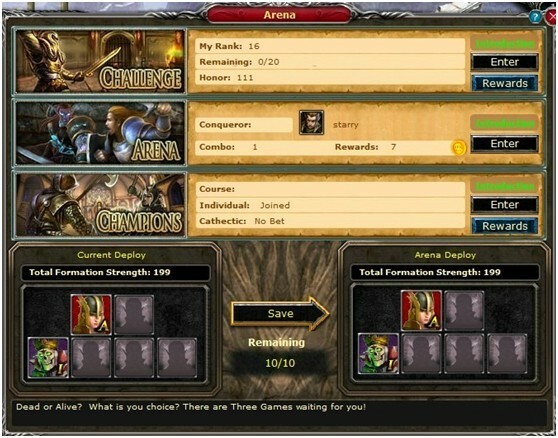 Players can click the â€œIntroductionâ€ button to recognize some rules of match. Letâ€™s see the new content. PS: Please deploy your troops first whatever you want to join any form of arena. â€» When you want to join in the arena, please have your own force first. If your force is 0, you canâ€™t enter any match. â€» When your force is 0, you canâ€™t save your deploy. â€» Whatever you win or lose, your force will not loss. â€» Arena deploy can change 10 times each day. Each level can share the challenge. 2.Â If you are in top 10, you will be announced in the world. 3.Â Top 500 players can win the arena presents. Top 32 will win big surprise. â€»Â Players can buy equips or items in honor shop. â€»Â Players rank by score. 1)Â The challenge score will be clean each week. The top 10 in each week can win an award: equips and gems. 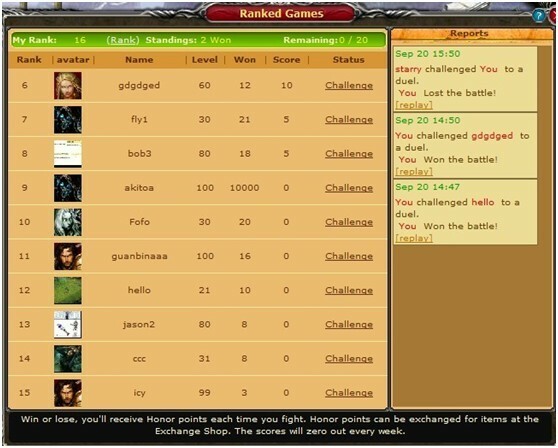 2)Â Top 10 players: each win can get 5 score and lose will decrease 10. 2ï¼Ž Challenge need 10 gold each time. 3 for system, 3 for bonus and remains 4. If the conqueror wins, he will get 4 gold. 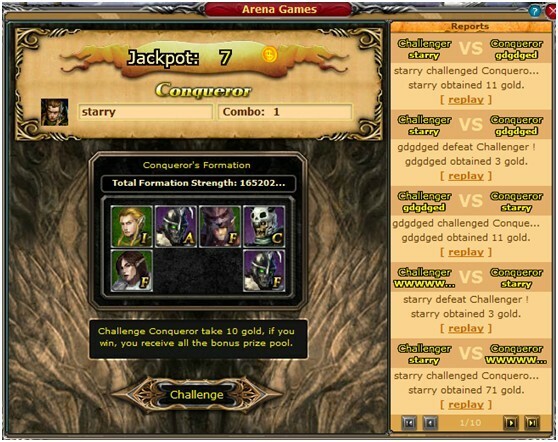 If the challenger win, he will win the jackpot. 1. 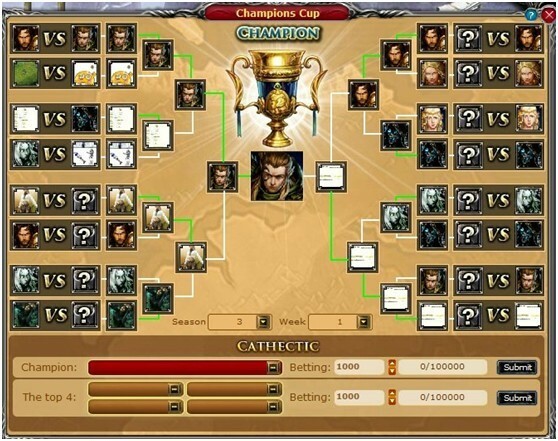 The champion will be held on 19:00 PDT each Saturdayï¼Œ system will choose the top 32 players in challenge match. Playersâ€™ force will be distributed to the 32 blank random. 2. Match will have 5 rounds at most. Each battle has 10 minutes. Players can use the rest time to see the next opponent and change your force. 3. When you win top 8, you will be get the award. 4ï¼ŽAll players can bet the top 32 players. The bet price is from 1K to 100K. Bet time is from Monday to Friday. If you bet successfully, you will get double of your bet price and a bet gift. The gift contains gems, equips and skill books.